Title catch your fancy to read? I hope so. I am just about booked solid until the first of July, and even had to “skip out” of a few commitments to stay with Alex while David and Mari made a quick trip east to Berlin (before you thought north in NH). In fact, Gary had to cover for me on Friday the 31st, then I ventured to their home as the snow diminished falling on April 1. Save up for admission – seemed pricey, but actually very well worth it. But, a hint right up front — find a parking garage 3-4 blocks away for twenty something dollars, the garage next to the aquarium was $39 for my four and a half hours — I only wanted to rent a space, not buy one. The interesting plants with roots extending down (Faux in the exhibits, but so well done) are Mangroves that have adapted for coastal shores. These extensive root systems filter out most of the salt out of the Mangroves’ needed water. What salt does get into the plant goes to the older leaves that then die and are shed. 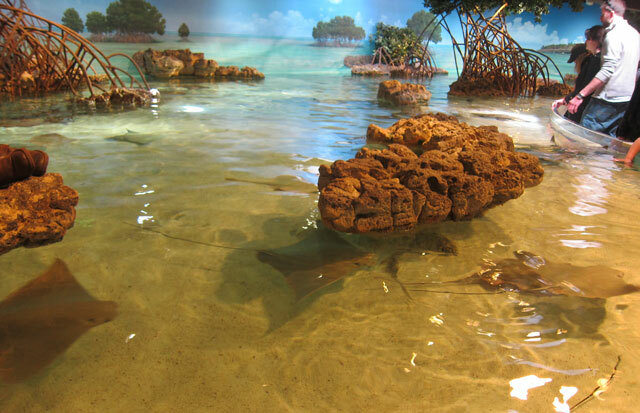 The root systems also provide protection from predators for many small fish, and safety for larger ones to mature in. 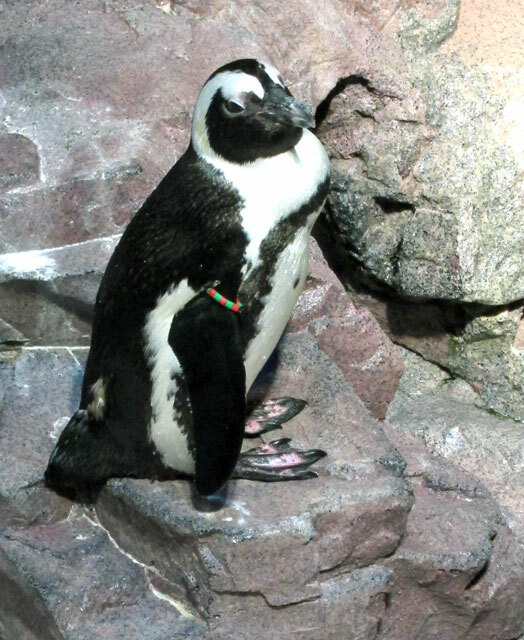 In my days in Antarctica I played with Adelie and Emperor Penguins that scientists had in enclosures “on the ice.” Here in the aquarium on the first floor were about 5 other Penguin species that I did not know about. Also one of the information panels explained why Penguins are black on top, and white on the bottom, It is camouflage from predators. With white predominantly on the under belly, when a predator looks up the Penguin will blend in with the light above, and when a predator looks down, the dark side of the Penguin will blend in with the darker ocean below or bottom. Another fast fact I can share. 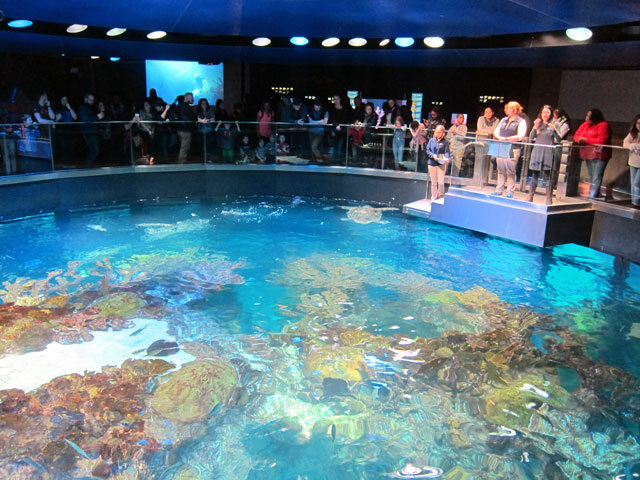 Surrounding the massive ocean tank are displays on four levels. 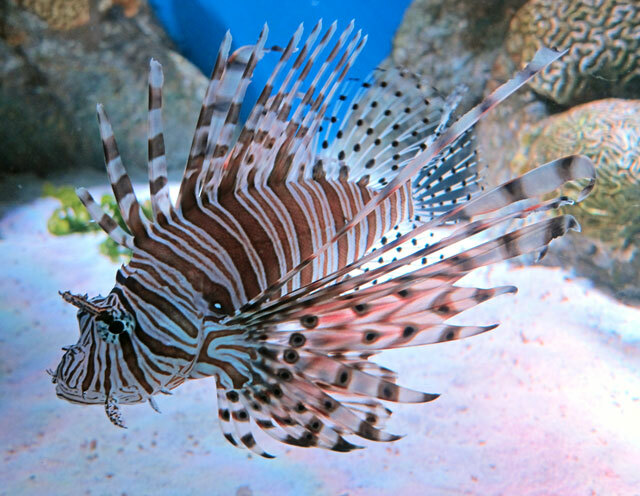 Most amazing fish I have ever seen, and lots of information to read. Sometimes a fish will even pose for you. 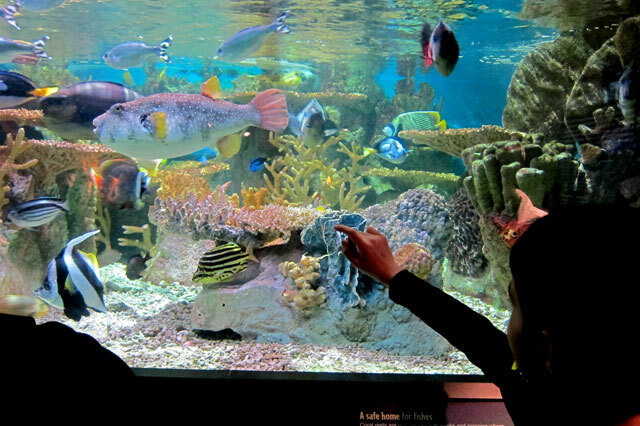 Alex pointing out various fishes in a colorful tank. 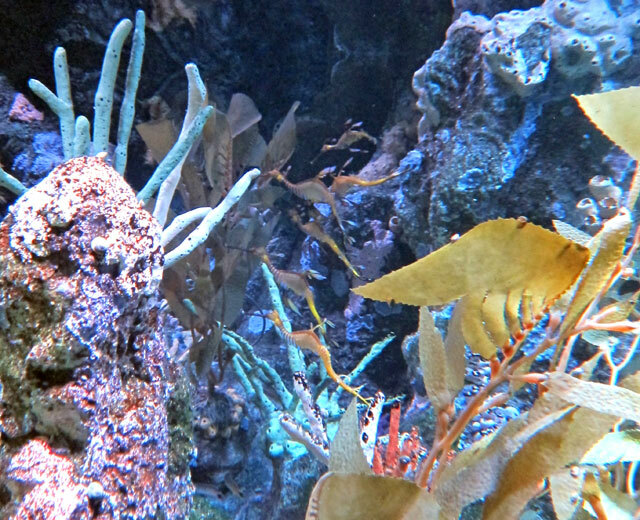 Can you find the 6 Dragon Fish in the center of this image? 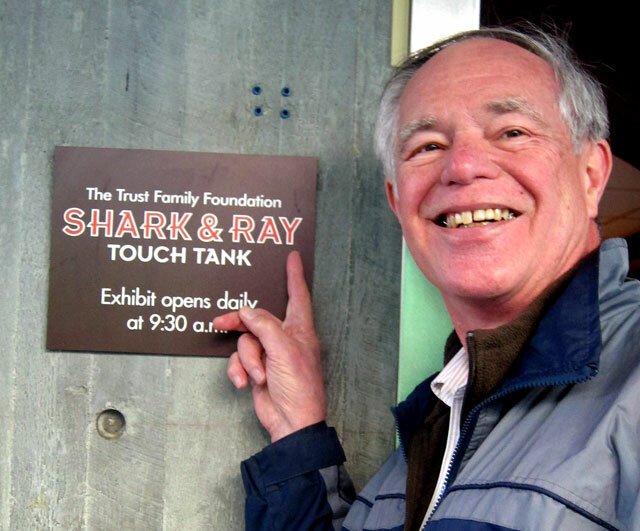 And the top of the ocean tank is open for informative talks. There is a scuba diver in the tank, answering questions from the lecturer and audience. Projected for all to see is a view from a camera worn by the diver. 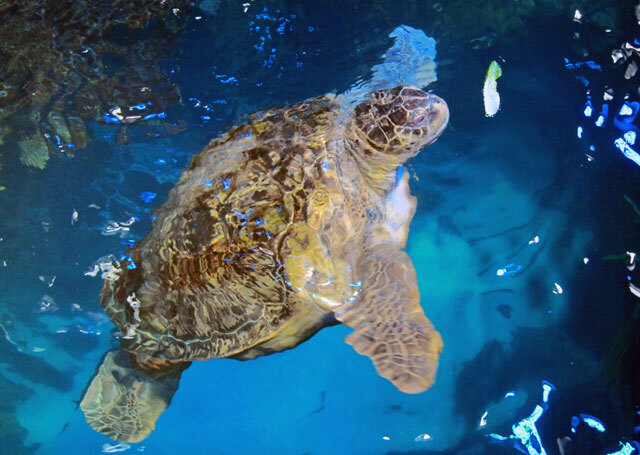 I have always enjoyed turtles, and this 90 year old youngster is fed lettuce. You know I like to share things you may not know about or have seen. Alex and Gary spotted a sign for artwork by the North Atlantic Fur Seals after we left their play area. Here is one of their pieces on display. The seals only see shades of gray, so their keepers help them select colors. The seals hold the brush, attached to a mouthpiece, and go to work. 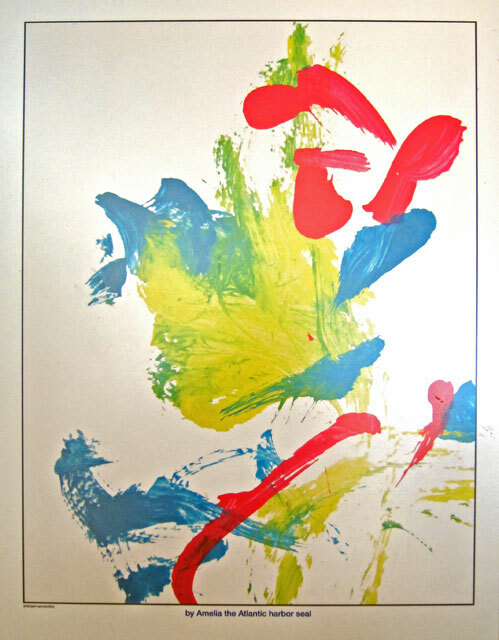 Original pieces were for sale in the gift shop for $70 – to benefit the seals. About 4PM we left, and walked along the harbor towards the North End. 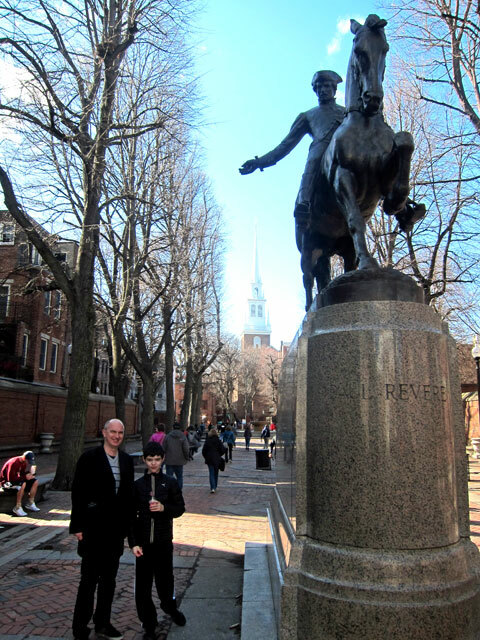 We cut through the Paul Revere Mall. Here are Gary and Alex with the statue. That is the Old North Church in the background. As you know, two lanterns were hung there April 18, 1775. One is on permanent display at the Concord Museum. The second, seldom seen lantern, will be exhibited by Prof. RAB in his Wagon of Wonders at Old Home Days on June 24th. It is MondayApril 3 and I accomplished my plan and more. 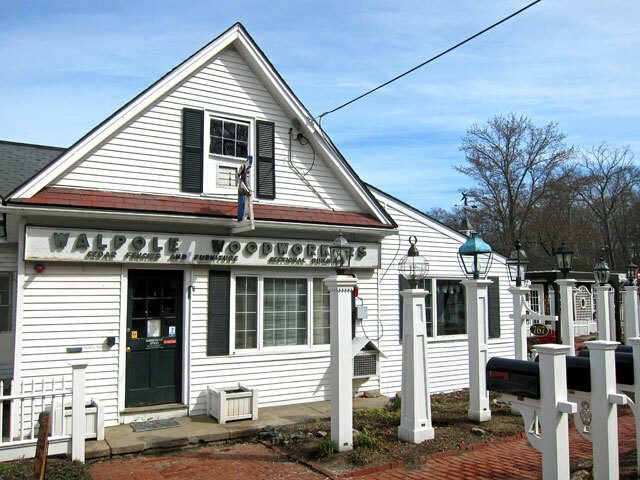 When asked by strangers where I live, to my reply they usually exclaim, “oh, you have the prison and fence place.” “No,” I hasten to explain, “that is Walpole, Massachusetts.” It was about time that I saw Walpole, MASS, but I also am searching for the right fencing for a garden project off my porch — it made sense to visit. Heading south on I-95 (sorry) I exited on route 109 and WAZED back country roads through lovely Walpole, MA, countryside to Walpole Woodworkers, now called Walpole Outdoors. 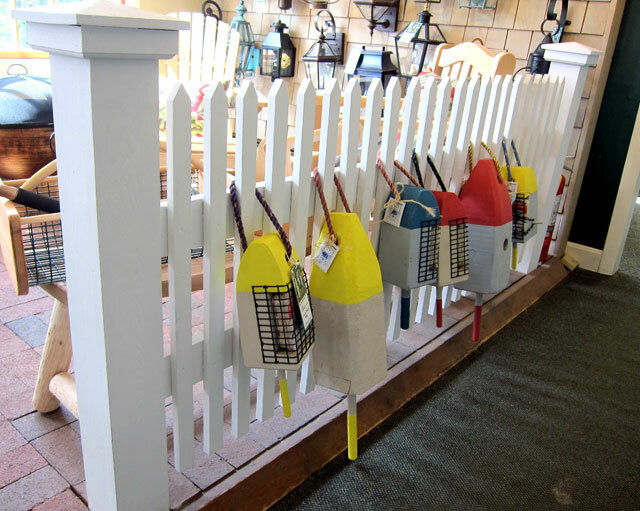 Remember my mission after visiting Fort Griswold where I saw the type of fence I would like? Pretty close to what I would like to have — still need to figure it all out. Some things you just have to do — and since always asked, I had to see Walpole, Massachusetts, and the Walpole Prison, now (because local residents did not like having a prison named for the town) called Massachusetts Correctional Institution—Cedar Junction (MCI-Cedar Junction) after an old railroad crossing. In the 1970s (when still called Walpole) it was one of the most violent prisons in the country. Remember that with my “galleries” you can click an image to open a slide show of larger sizes. Before I left the house I searched for other things I could do on the way home if I had time. 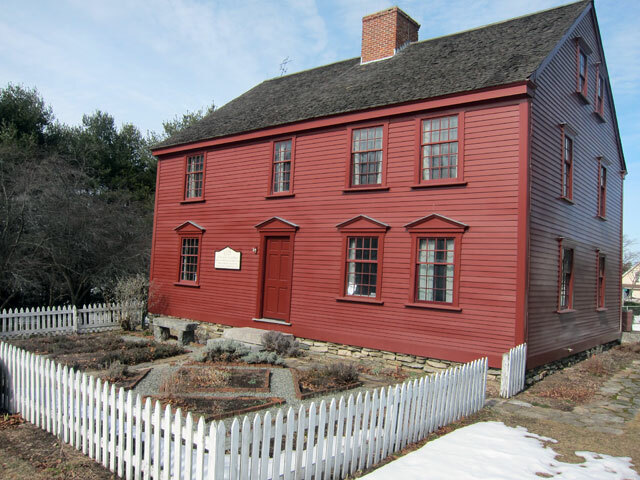 Of course, The Adams National Historical Park in Quincy. The houses would not be open until mid-April, but (according to the Google sidebar) the Visitor Center was open – NOT. The center is in the “city” itself, with the homes around town. There was a rack of information brochures which I feasted on, and with the DISCOVER QUINCY Guide (visit the website) I was off punching addresses into WAZE. 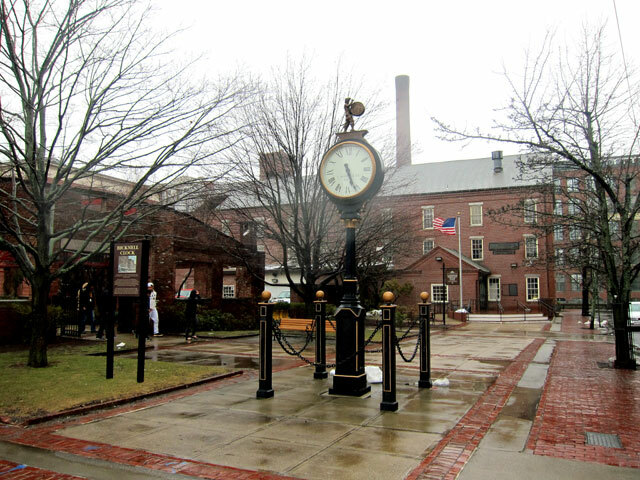 Of course, wrong time of year to visit – everything closed, but Quincy is close enough to spend a day in season. 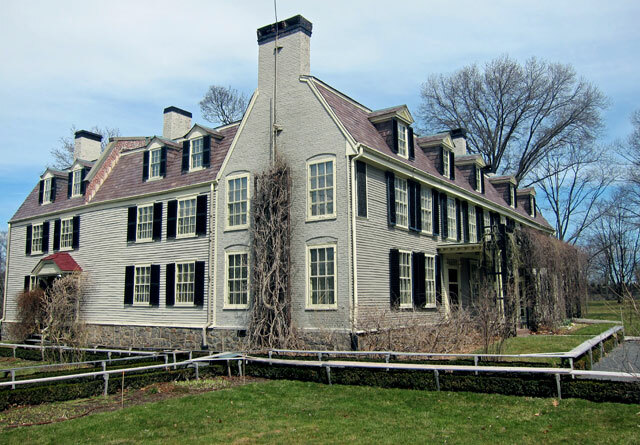 I stopped first at Peace Field – residence of four generations of the Adams family from 1788 to 1927, and home to Presidents John Adams and John Quincy Adams. Peace Field – Quincy, Massachusetts – Home to Two Presidents. I then drove over to the John Adams and John Quincy Adams Birthplaces – and encourage you to discover what all happened here. I was intrigued reading the history of the Quincy Granite Quarry and industry, and did remember that the railway to move the granite for the Bunker Hill Monument was the nation’s first commercial railroad in 1826 (remember I was in Jim Thorpe, PA, with Scott and Betty where the second railroad moved coal – the Mauch Chunk Switchack Railway in 1827). 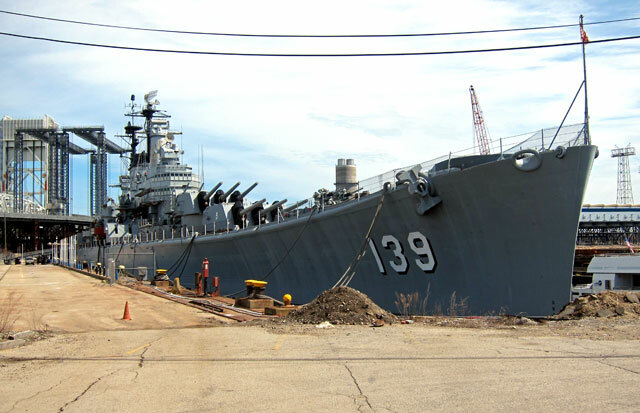 Next I stopped to see the USS SALEM , CA-139, a heavy cruiser built in Quincy just after World War II. From there I followed Quincy Shore Drive (along Quincy Bay) north toward I-93 and Boston. Never had I been along this area – great “filling in more map.” I turned onto the road for Squantum Island first settled about 1638 to explore. But now just mostly 20th century homes. And below, a different view of Boston. But I was there. Soon onto I-93 – through the Big Dig tunnel, and about 8 miles back to David’s house. With the collection of material I picked up in Quincy were a couple great Boston maps. 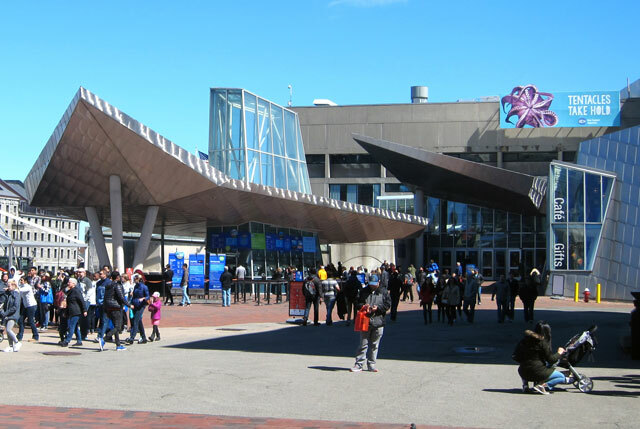 After chatting with Gary about the fun things to do that are relatively close, I think I will have to explore more in Boston, just have not done that (you know I am a country boy, and prefer that lifestyle). Tuesday, raining and working on projects. Plan to head to Lawrence and a big antique center and lunch. Will report on that later. Now evening, and the day has been a WASH OUT with rain and a worthless Canal Street Antique Mall which instead of over 30,000 square feet of antiques had simply worthless junk, and not even junque. BUT, it got me to Lawrence, MASS, and seeing the sign “Welcome Center” I got to experience the Lawrence Heritage State Park. RAY RECOMMENDS you make a stop to learn all about how Lawrence was planned and its importance in textile and labor history (1912 Bread and Roses Strike). Lawrence Heritage State Park – Lawrence, MA – entrance into former Mill Boarding House. Remember it is raining, so no good outside images (but now I regret I did not take one of the front of the museum and the north canal). I have history panels in a gallery at the end that may be of interest to you. On the Merrimack River, Lawrence was built in open agricultural land taken from two other towns in 1845. The river was dammed and parallel canals dug to then power the mills (more later). 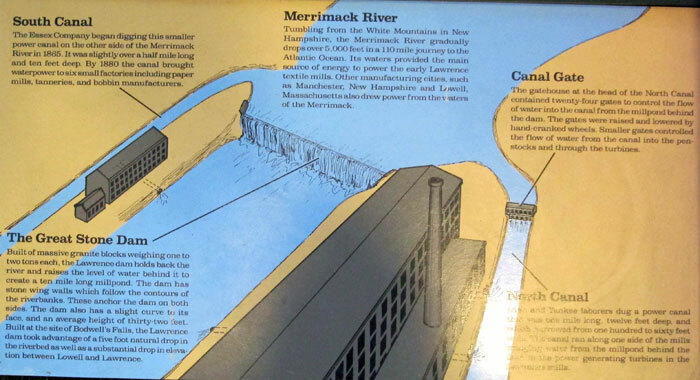 The Merrimack River, which begins in the White Mountains, powers mills in Manchester and Nashua, NH, and then Lowell and Lawrence Massachusetts. We think of most rivers (Hudson, Connecticut, Mystic, Mississippi) flowing south, but the Merrimack turns back up northeast at Lowell, finally emptying into the Atlantic at Newburyport, Massachusetts. 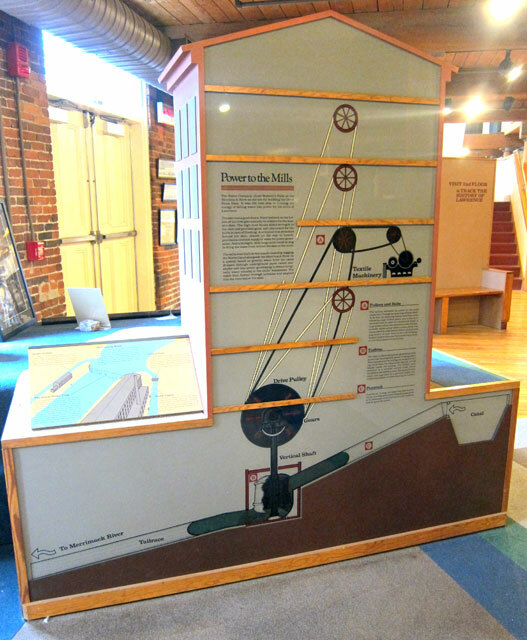 Here is the first floor exhibits of mill operations and the development of Lawrence. This panel will give you an idea of how the river was dammed, and the flow of the north canal to the right, and smaller south to the right. This cutaway below is fantastic telling all (and better display than what I saw the end of last year in the Manchester, NH museum). The canals are higher elevation than the river due to the dam. Water will flow through a turbine or waterwheel under the mills to drive the belts to drive the machinery before flowing back into the river. Let me come close to concluding before the information panels in case you want to skip those. The tad over an hour I spent in this Visitor Center/Museum was great, and the State of Massachusetts has other state parks where you can learn more about Massachusetts’ industrial heritage: Blackstone River and Canal HSP, Holyoke HSP, Western Gateway HSP, and Lynn HSP. I have been to the to the Western Gateway HSP in North Adams, and now want to go back. HISTORY PANELS from the Lawrence Heritage State Park that you can click to open larger for reading. This entry was posted in Day (or maybe two) Trips and tagged John Adams, John Quincy Adams, Lawrence, Lawrence Heritage State Park, Mass., Massachusetts, New England Aquarium, Quincy Mass, Walpole. Bookmark the permalink. Always great fun shunpiking with you. 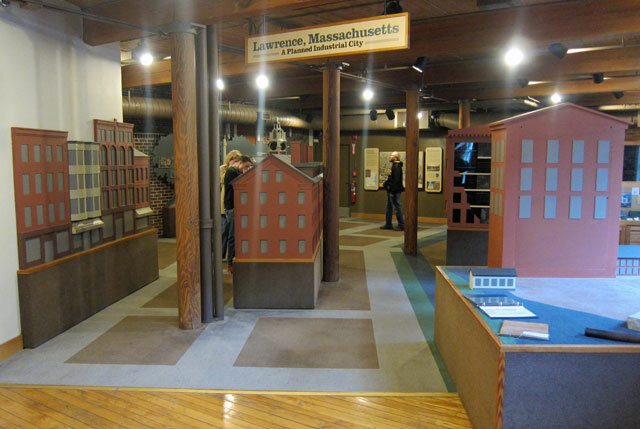 I visited Lawrence Heritage and Lowell State Park when years ago, my sister and brother-in-law lived in Lowell. Thanks for the memories.